Creately, an online diagramming and design application launched by Cinergix and showcased at TechCrunch50’s Demopit in 2008, is unveiling its online tool to the greater public (the startup has been in private beta). Creately lets anyone create create and collaborate on flow charts, wireframes, network diagrams, sitemaps and more within its site. The key to Creately’s application is that manages to harness the abilities and tools that traditional design and graphics software offer, but packages this functionality in an easy to use application that allows for collaboration between users. The design features are varied but relatively easy to use and intuitive. 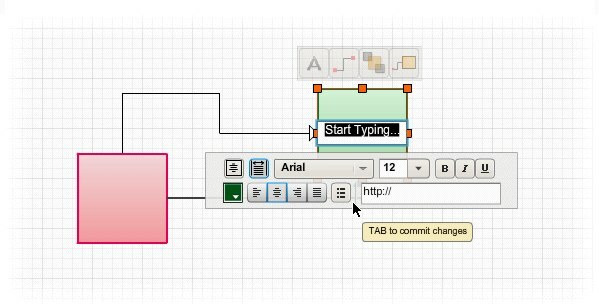 For example, Contextual Toolbars appear when you click on any object on the drawing canvas and depending on the object and its size will offer all the commonly used operations within the toolbar. Collaboration is another crucial part to the design process, says co-founder Charanjit Singh, so the startup built in commenting, sharing, publishing, embedding and the ability to publish directly to Twitter. Plus, many of its offerings are free to use. With this public launch, Creately is also unveiling its pricing model and monetization strategy. Creately will offer a free plan that lets users makes and unlimited amount of public diagrams that can are published on Creately and visible to anyone. Free customers are restricted to a maximum of 5 collaborators and all diagrams will be published with the Creately logo. Diagrams can also be embedded and shared. The paid version will offer an unlimited amount of privately-hosted diagrams that will not have the Creately logo. But it’s unclear how much Creately’s paid version will cost and we’ve contacted the company for further explanation. Microsoft offers a design program, Visio, that’s has similar functionality to Creately but is more complicated to use and is not web-based.